Liquid collagen supplement. The collagen in this supplement is obtained from fish. 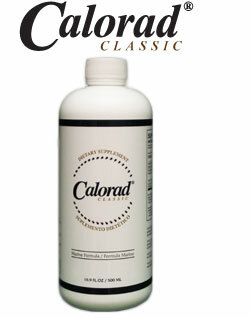 Calorad® is the original collagen weight loss product distributed for years through Essentially Yours Industries. Essentially Yours was a network marketing company and is no longer in business; however, we are still able to obtain the Calorad formula for our customers. Each night, before bedtime and on an empty stomach, drink 0.5 fl.oz. (15 ml) of Calorad® with 7 fl.oz. (210 ml) of water. Shake before using. Calorad when used as directed, is effective for most people to help their bodies lose unhealthy fat and inches, without losing muscle, and helps provide a greater overall sense of wellness. Other Ingredients: water, glycerin, sodium benzoate (preservative), potassium sorbate (preservative), natural lemonade and orange flavor, citric acid. Do not use as sole source of nutrition. Not recommended if pregnant or lactating. Due to the fact that this product is made with natural components this color and/or taste may vary.